Do you need more targeted keywords for your SEO or Pay-per-marketing efforts but have been sorely disappointed with existing keyword tools? You now have the opportunity to acquire a very unique tool that can uncover 1,000's of little known keywords from the most popular search sites like: Google.com, Yahoo.com, Bing.com, YouTube.com, and Amazon.com. Initially I created this tool to use for my own keyword research on niche sites & articles as well as for PPC campaigns and now I'm sharing it with the online community for the first time. Please read more to find out how this revolutionary tool can help with your online marketing efforts. Long tail keywords are simply multi-phrase search queries which visitors use on search engines to arrive at your website. These long tail keywords are much more targeted than the general or main keyword topic and they literally embody a visitor's need for specific information. These long tail keywords are actual search queries, therefore optimizing your site and creating content or PPC ads to match these search queries will allow you to attract visitors who search for information via these and similar search terms. When applied to websites and search engine marketing, it simply means that most websites are likely to receive most of their search engine visitors through a variety of low-volume search queries instead of a handful of major single or two word keywords. Therefore focusing on developing the keywords which receive lower volumes of search traffic will lead to an increase in the overall amount of visitors from search engines to your website...Sweet! Long tail keywords lead to higher conversions. Visitors arriving through multi-phrase search queries might be more likely to make purchases or convert on affiliate programs or recommendations. By targeting these long tail phrases, you are effectively targeting a market of potential buyers. 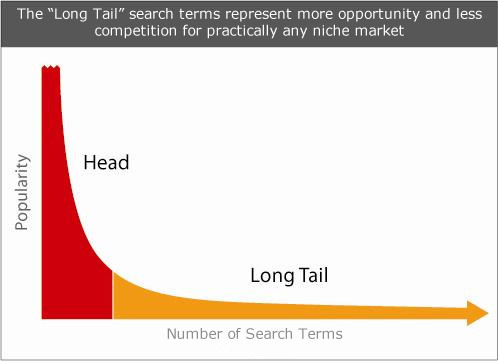 Long tail keywords are easier to rank and less expensive to bid on. It is much easier to make your website rank well on search engines for long tail keywords because of the generally weaker competition. More visitors to your website. Targeting long tail keywords will gradually lead to more search engine traffic because you'll have a lot of pages indexed and ranking for specific phrases related to your website/business. You can also expand your pay-per-click campaigns significantly. This means increased visibility and therefore a much larger amount of search engine traffic. Higher monetization potential. Search engine visitors are very valuable because they are targeted individuals who are seeking specific information and hence are more likely to click on contextual ads or subscribe to your site newsletter or blog feed. This grows your audience and allows you greater monetization potential in the long run through product sales or the use of third-party ad networks. How Does Keyword Ninja Help With This? They uncover just a few of the many long tail keywords actually typing into search sites. They are over priced or require a monthly subscription. They produce random made-up keywords that don't reflect real queries. Keyword Ninja does one thing very, very well. It finds tons of real long tail keywords from all over the internet. It is a robust desktop software program that utilizes the "search suggestions" feature of Google.com, Yahoo.com, Bing.com, YouTube.com, and Amazon.com to grab keywords that visitors type in as searches. It generates results based on a set of primary niche keywords that you provide and allows you to export them to a .csv file for easy viewing & editing in Excel, Google Docs or any other spreadsheet program. Again, Keyword Ninja uses some of the world's largest websites whose search functions are used millions of times daily when searching for products and services online. 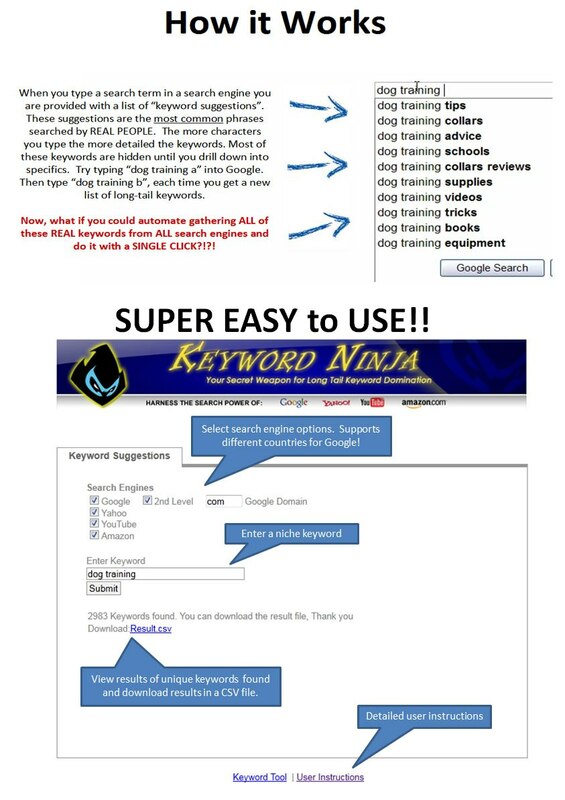 The "search suggestions" feature of these mega-sites will point you to the most common keywords that people type in and by using Keyword Ninja you will get 1,000s of those keywords with a single click of your mouse! Since keyword suggestions are the most relevant and in-demand search terms people use, you can use them for any number of your online marketing activities (such as keyword and market research) to increase your business' profits. What are Some Other Tactics for Using Keyword Ninja? After seeing all of the features you probably already have a few ideas in mind for how this can be put to good use but here are a few more ideas. Discover 1,000's of negative keywords to get huge savings in PPC every month! Create eBay affiliate feeder pages and make money when new users register for eBay. Create Squidoo lenses and get your share of the profits Squidooo generates. Create niche market private label rights packages and sell them for a quick profit. Find undiscovered domain names ideas that you can target for direct type-in traffic. And More!...your imagination is the only limitation! How Is This Different From Other Keyword Tools? 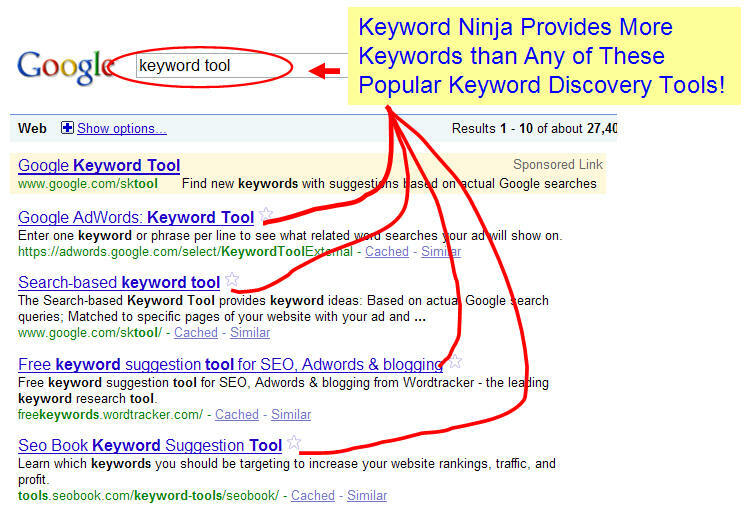 The short answer is that Keyword Ninja provides more long tail keywords than any other keyword tool on the planet! You will be utterly shocked by the number of real long tail keywords that are missed by other tools. And you want "real" keywords because some keyword tools just make them up by combining various words into a lot of different variations which is a complete waste of time. With a single click and within seconds you can have ultra targeted list of keyword suggestions from the largest sites on the internet. It's very easy to use, just enter your base keyword(s) and click start! Get ONLY the keywords that have ALREADY PROVEN TO BE EFFECTIVE and not some that are randomly created by keyword combination software. It's a fraction of the cost of other keyword tools and you own it once you pay for it! NO more monthly fees! I have to say I was pretty impressed with this tool. 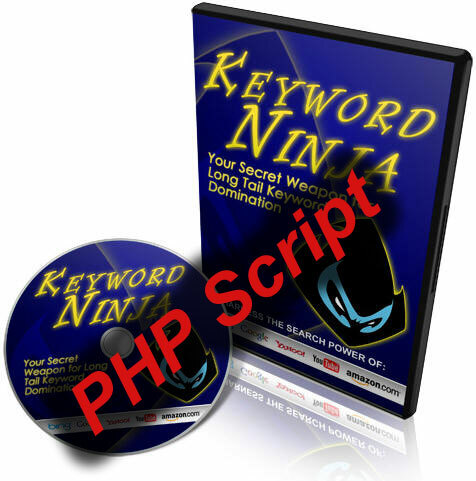 As a geek myself and coding my own keyword engine I can say that Kevin has done a fine job with this tool and it can generate a ton of powerful keywords very quickly that you can use in your own campaigns. Nice work man and look forward to seeing this tool evolve into a keyword powerhouse! All the best! I recommend you get this script before the price goes up, this is a great tool! To anyone else who is lost for ideas on how to find good keywords - you have to try this tool out for yourself. It is awesome! Yesterday I was having a hard time thinking about content for a new website so I put my main keywords in there and Keyword Ninja kicked out (no ninja pun intended) some new topics for me in just a few seconds.... if you're on the fence on this one, it's a steal. This is an awesome tool. I just bought it last night and have already uncovered a huge list of long tail keywords to use when promoting one of my new niche content sites. Just downloaded your new script. Great tool! I have purchased many keyword tools for big dollars, but none of them gave me the kinds of results I needed. Keyword Ninja gives me exactly what I need in a clear and straightforward manner. This is an awesome tool! WOW!!! Keyword Ninja is awesome! Definitely worth the investment. Keep up the good work! [Q] Can this script be installed on my computer? 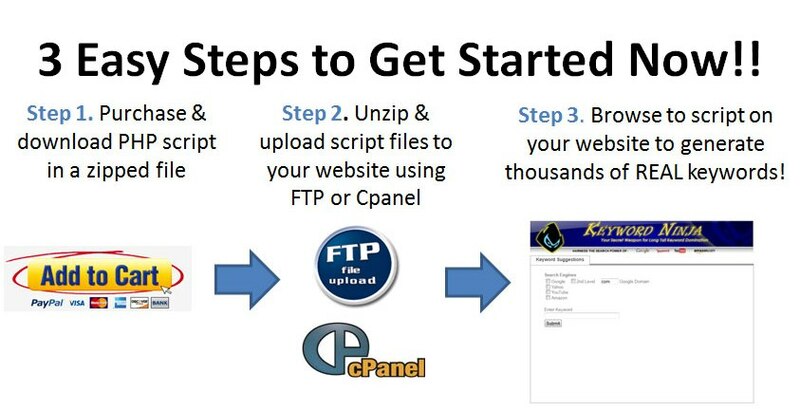 [A] No, you must upload all the script files to a directory on your website. i.e. mydomain.com/keywords and you can then run the script from there. [Q] Is this a Wordpress plugin? [A] No, it is a standalone script. It does not interface or interfere with Wordpress. [Q] Are there any special computer requirements for this software? [A] No, since this is a PHP script that you run on your website (not your personal computer) The only requirement is that your domain hosting company must support PHP5. [Q] Is this compatible with a Mac? [A] Yes, since the script is web based it can be run from any browser. [Q] Will updates to the software be available for existing customers? [A] Yes, any updates to the script will be 100% FREE.